This database includes weekly water temperatures under historical and future conditions for 124 stream temperature sites across Washington State. 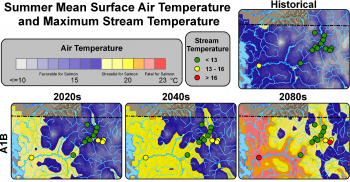 Projected changes in stream temperature are based on regression parameters estimated for each site that establishes a correlation between observed air and water temperature. Water temperatures were projected using the input from 10 climate models, under two emissions scenarios (A1B and B1), for three future time periods (2020s, 2040s and 2080s). This project was part of a larger effort to assess the impacts of climate change on eight major sectors for Washington State (the Washington Climate Change Impacts Assessment 2009). This project supports aquatic management by quantifying the anticipated impacts on aquatic habitats used by salmon (Oncorhynchus sp.) as a result of rising water temperatures. Projected changes in water temperature were estimated for more than 100 river locations throughout Washington State using air temperature data from downscaled global climate models (Mote and Salathé 2010) and observed historical variations in water temperature(Figure 1; Mantua et al. 2010). 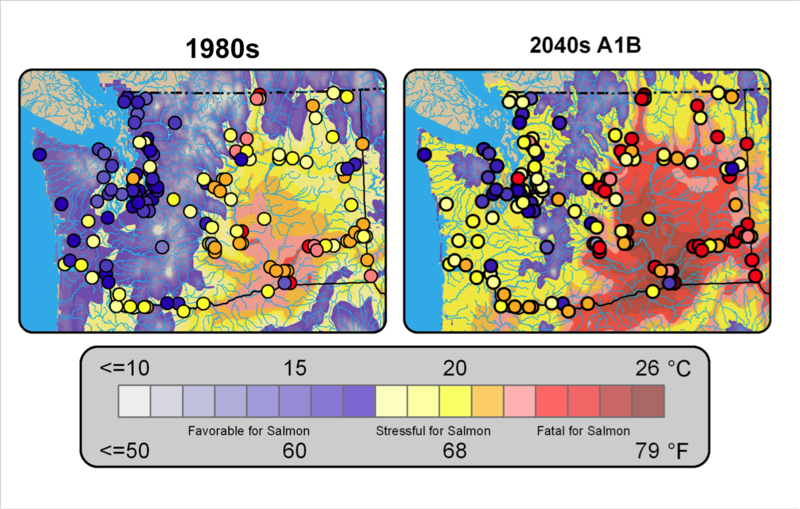 These projections allow aquatic resource managers to determine where salmon species might become thermally compromised in the future. Figure 1 Colored continuous shading shows the mean surface air temperatures for the month of August for the historical (1970-1999) on the left and the future (2030-2059) under the A1B scenario. The shaded circles show the simulated mean of the annual maximum for weekly water temperatures for select locations throughout Washington State. Colors are shaded to highlight thermal tolerances for Salmon, ranging from favorable to fatal (EPA 2007). Figure source: Mantua et al. 2010. The water temperature data generated by this project are of great interest to water resource managers, including Seattle City Light (SCL) and the WA Fish and Wildlife Department. In a follow-up study with SCL, the CIG estimated projected stream temperatures in key locations on the Skagit River (Figures 2 and 3) and its tributaries to anticipate changes to fish habitat where SCL runs its dam operations. SCL is committed to maintain viable salmon and bull trout habitat in the Skagit watershed and can adjust dam operations in an effort to ameliorate water temperatures for coldwater species. This study demonstrated interesting patterns of orographic effects on localized stream temperature projections. This can be seen in the map where sites located on the west facing slopes (red and yellow dots in the upper watershed) warm faster than those located on the east facing slopes (green dots). 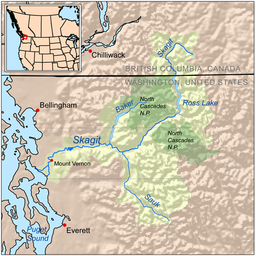 Figure 2 Map showing the location of the Skagit River, detailed in the maps below. The projected air temperature data used for these analyses were derived from the 10 statistically downscaled global climate models included in the Washington State Climate Change Assessment (see Mote and Salathé 2010 for details). The global models from the assessment were downscaled under the A1B (moderate warming) and B1 (mild warming) scenarios. The projected air temperature fields were averaged to determine weekly estimates for each grid cell that overlapped the stream site where observed water temperatures was available. These weekly average air temperatures were used to develop a regression model that relates weekly air temperatures with observed water temperatures at each site. The water temperature projections for this project were estimated using a non-linear regression developed by Mohseni et al. (1998). 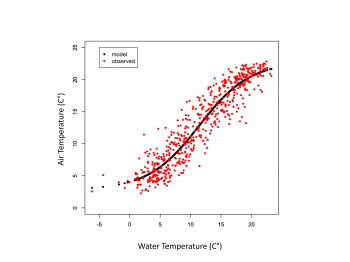 This approach uses ambient weekly air temperatures to approximate weekly water temperatures at a given location (e.g., for the Bonneville Dam on the Columbia River depicted in Figure 4). The regression model establishes unique parameters for each site based on observed water and air temperature data. By applying the regression to the downscaled future air temperatures, this study projected future water temperatures for over 100 stream temperature sites throughout Washington State (Figure 1; for more details, see Mantua et al. 2010). 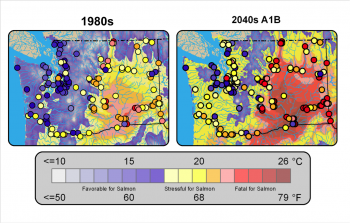 These estimates provide water resource managers with some sense of how aquatic habitats may change for salmon and where to prioritize restoration. Figure 4. A plot illustrating the non-linear relationship between air and water temperatures at a stream temperature site near the Bonneville Dam on the Columbia River. This research was funded by the Washington State Legislature House Bill 1303. Mantua, N.J., I. Tohver, and A.F. Hamlet. 2010. 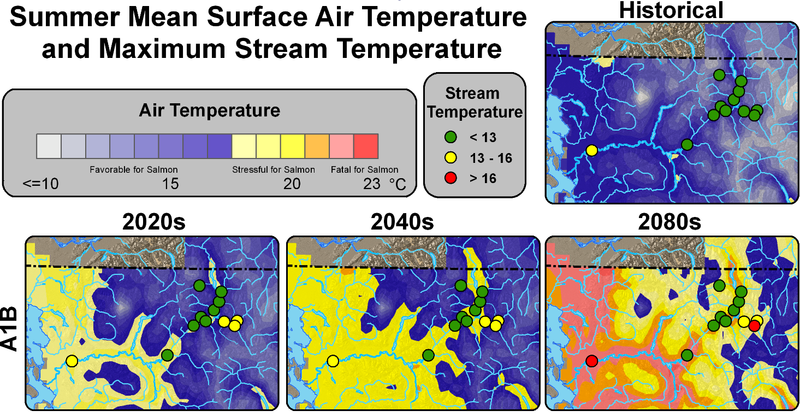 Climate change impacts on streamflow extremes and summertime stream temperature and their possible consequences for freshwater salmon habitat in Washington State. Climatic Change 102(1-2): 187-223, doi: 10.1007/s10584-010-9845-2. There are no updates to this project at this time. Environmental Protection Agency (2007) Biological evaluation of the revised Washington water quality standards. US EPA, Seattle. Mohseni OS, Stefan HG, Erickson TR (1998) A Nonlinear Regression Model for Weekly Stream Temperatures. Water Resources Research 34:2685–2692.